A pig is a commonly found passive mob. The pig only spawns in the day time on grass blocks. When the pig is killed, it drops 0-2 raw porkchops, along with 0-2 raw bacon. If it dies while on fire, it drops 0-2 cooked porkchops and 0-2 cooked bacon. The pig will wonder around aimlessly, avoiding hazards in its direction. It can jump up to two blocks high. The pig is not hostile, so it will not attack, even if it has been hit. If hit, it will run back and forth for a couple of seconds, like other passive mobs. If a pig is struck by lightning, it turns into a zombie pigman. The pig can be made rideable for the player by placing a saddle on its back. While riding the pig, the player can control the pig's movement using a carrot on a stick, however this is limited to sideways movement, as the pig will jump randomly by itself, and if the player presses the jump button they will dismount from the pig. If the player sneaks, the pig will stop, however otherwise it just keeps going in the direction it was going in before, not avoiding any drops. As the pig moves, the durability of the carrot on a stick goes down. Pigs turn into zombie pigmen when struck by lightning. If a pig is struck by lightning, it will turn into a zombie pigman. 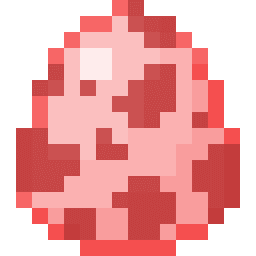 A pig's egg used for spawning pigs in creative mode. A pig found in the wild. A pig with a saddle attached on it. A pig with a saddle. This page was last edited on 21 December 2018, at 15:10.